Gerald Seib is the chief correspondent covering politics in Washington D.C. for the most important newspaper of Corporate America – the Wall St. Journal. That’s why when he writes, people should listen. A recent column of his bemoans the situation in the US Senate. 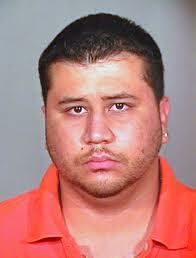 What he wrote also helps explain why George Zimmerman was acquitted. Seib wrote: “The Senate is in danger of undergoing a partisan meltdown…. The Senate… has become polarized and riven by passions and partisan fractures.” Seib explains that the “framers of the Constitution” designed the Senate to be able to rise above such “partisan fractures.” In other words, it was designed to represent the interests of the capitalist class as a whole, rather than individual factions of that class. Many workers today would tend to ignore these developments. They tend to feel that the whole system is “corrupt” and what the politicians do is not our concern. It’s like a big game hunter who refuses to study the behavior of the major beasts of prey. As the crisis of US capitalism deepens, increased attacks on the working class become necessary. To enable those attacks, it is necessary to increase the prejudices and confusions that have always existed. 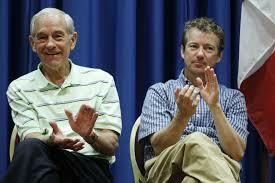 Ron Paul and son and US Senator Rand Paul. Both have been associated with the Nazis. In a bygone era, it was said that the entire membership of the Republican Party could be fit into one country club. But that was in an era when the base of support for capitalism was almost unchallenged in the US. Those days are dead and gone. A recent poll for instance, showed that over one third of Americans view socialism favorably. That figure is bound to rise as amongst young adults (19-29) the figure is 49% (vs. 43% who have a negative view). In order to counter this, one wing of the representatives of the US capitalist class have to stir up all sorts of prejudices and religious confusions. These include racism, anti-immigrant feelings, and sexism. It also includes the reliance on mysticism that Christian fundamentalism bases itself on. The Republicans are increasingly basing themselves on these fervors, and they reflect that at all levels of US politics – all the way up to the US Senate. While good, your article should have emphasized more how capitalists have historically used racism to divide workers, and how the working class is politically crippled by it today. Today there are some “enlightened” capitalists who recognize and give lip service to concepts of inclusion and acceptance of all racial groups. But this was not always the case. I won’t elaborate here by citing examples. However, today’s enlightened capitalists want to demonstrate they are “good” corporate citizens because they know not doing so will effect their bottom line. Whether factual or not, they want to celebrate their nondiscriminatory hiring practices and the numbers of minorities they have promoted into management. Everyone in the corporate world understands the importance of this kind of P.R. particularly for high profile companies. Of course there are those capitalists who are not enlightened and refuse to play the P.R. game. They also are most likely to engage in the most flagrant forms of racism. But today corporate media plays an enormous role in shaping racial attitudes. Crimes and the way criminals are described in poor and minority communities is treated very differently than white collar crimes and corporate criminals who are primarily white. The capitalist media has also created and helped reinforce many racial stereotypes. For example, most whites have the impression that the majority of people collecting welfare are black when in fact 66% are white and 33% are black. This stereotype of blacks is important to the capitalists because it divides the working class by leaving white working people with the impression that their real enemies are not the capitalists who expropriate their wealth but instead the blacks who they support through their taxes on welfare! Most people have no idea that the total welfare expenditure is only 3% of the total federal budget! This is one of the most insidious ways in which capitalism works to divide the working class. Creating class division is of critical importance to the capitalist class and one of the most potent weapons in its arsenal is racism. Workers in the U.S. can never be expected to develop a true class consciousness until racism is neutralized as a political weapon by the capitalist class. Thank you, Thomas, for your comments. Of course, racism has historically been used to divide and conquer, as well as for super exploitation. In this, US capitalism is no different from the capitalist class elsewhere. Take Northern Ireland, for instance. Until recently, everybody there was white, so they used religion – Protestant against Catholic, with Protestant Ulster being their center of support. In Palestine, the British colonialists did the same thing, but they based themselves on the Jews who were living there. In fact, one British administrator referred to the Jewish community in Palestine as being “our loyal little Jewish Ulster”. And we agree completely that the racist prejudices enormously hinder the white US working class as far as developing an all-round class consciousness. Again, though, in this they are not all that different, except that they (we) are located in the world’s most powerful capitalist country in history. It always happens that the working class of a country takes on some of the attitudes of their capitalist class. This goes as far as nationalism and also as far as internal divisions. Take Egypt, for instance: There women play a role similar to what black people play here. They are brutally suppressed and the mass sexual assaults of recent months are not all that different from the lynchings of the past in the US South. And clearly racism stands as a key component of the Tea Partiers and their kind. Overall, Thomas’s points are a valid addition to the article. Thank you oaklandsocialist for your reply. All of your points are well taken. Indeed, the oppression of women and the LGBT community has much in common with the oppression of minorities. You point about this being a world-wide phenomenon that is characteristic of capitalism everywhere can be borne out by history. I agree this important to keep this in perspective. In the unique racist ridden tradition of the United States, when blacks began to migrate northward to take jobs in the factories, they were paid lower wages by employers than white workers. This was used by employers to crush union organizing attempts. Employers were able to play on the racial fears as well as the fear of job loss by white workers to create a backlash against blacks that spread through the reactionary union leadership of the period. It’s one of the reasons the AFL was called the “American Separation of Labor” by I.W.W union organizers. The I.W.W. was one of the first unions in the country to accept blacks into their membership. But I ramble too much.